The Normanby Local History Group is a non-profit making collection of people who are interested in keeping the rich history of this small area in the North East of England alive for future generations to enjoy. We research and uncover: archive records, photographs, artefacts and living memories of everything that has created the community of Normanby that we live or have lived in. We produce publications including calendars, postcards, prints and booklets on some fascinating subjects about Normanby including Spencer Hardwick's brilliant booklets on life growing up in Normanby gained from his 90 years of living here along with Eric Armstrong's booklet on The Poverina Pub, the Old Mill and Richardson's Brewery. 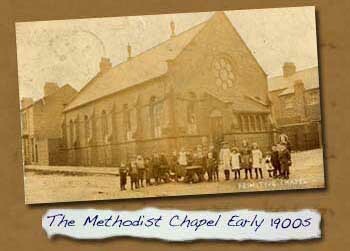 We hold monthly meetings as well as other events including exhibitions of our work and collections usually at the Normanby Methodist Church. You are very welcome to come along and see what we do. This website is to act as an online magazine where new and interesting articles on Normanby can be published and new material discovered with your help. You can add your memories of Normanby to our moderated Message Board and we welcome any photographs that you may have and are willing to share with us. You can view other parts of our website by ’clicking’ on any underlined italics text which provide links to other pages. These links turn pale-yellow when you move the cursor over them - then you can ’click’. Start your exploration via the links in the main Menu bar at the top of each page. This provides regular information on our group's events and activities as well as timely reports of local events together with great photos and videos too! See our facebook page. Normanby began as a small village in the North Riding of the county of Yorkshire. This county was succeeded (for Normanby) in 1968 by the county borough of Teesside which only lasted six years until 1974 when absorbed into the new county of Cleveland - itself abolished in 1996. 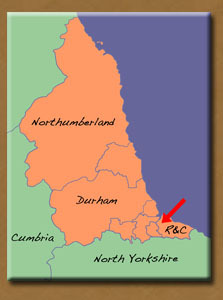 So Normanby is now in the borough of Redcar & Cleveland (within the ceremonial county of North Yorkshire). 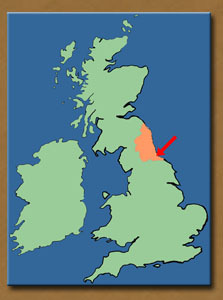 Nevertheless traditionalists consider Normanby still lies within the North Riding of Yorkshire. The Normanby Local History Group covers the geographical area from the top of the Eston hills northwards to the river Tees foreshore at South Bank. Spencer Beck forms the Western boundary, with Crossbeck forming the ancient Eastern boundary. However we have extended our area of research eastwards to include Woodgarth and Old Eston. - 9 April update of 1954 class photo. of 1950 Class 6 & 10, 1952 & 1954. - names in Classes F, H, I, J, K, L, Y, Z. - Can you provide names & more information? - has passed away aged 95. - of workers in the Eston Ironstone Mines. 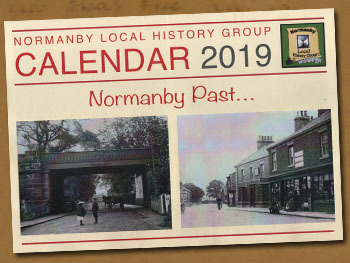 Publication of our new 2019 Calendar of "Normanby Past..."
- pictures in the new improved format. - was an integral part of Normanby life for many years. See all the Previous Page Updates. - see our Events page. - for more information see our Events page. 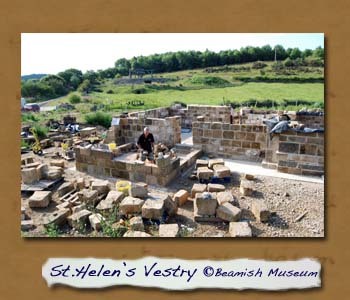 For details of previous events - see our Past Events page. 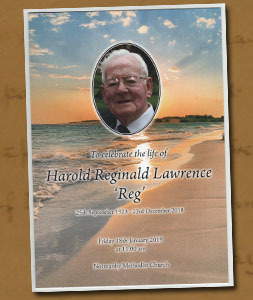 Our group’s oldest member Harold Reginald Lawrence passed away peacefully on 23rd December in hospital in Newark. Reg had been ill for some time and has been living with his daughter in Newark. 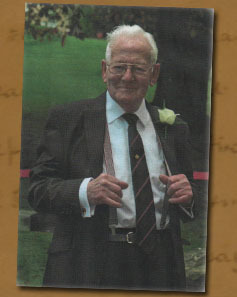 He was a founder member of the Group and was 95 years old. The funeral service was held in Normanby Methodist Chapel at 11am on Friday 18th January, followed by cremation at 12:00 at the Redcar Kirkleatham Crematorium. Members from our group attended the service. Following the cremation refreshments were provided back at the Normanby Methodist Chapel. Please click on the images opposite to see a larger image ! 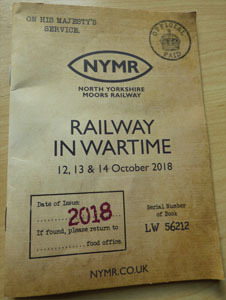 Members of our group spent a day visiting Pickering for the North York Moors Railways 26th "Railway in Wartime" event. It was both interesting and informative as well as a very enjoyable experience despite the rainy weather. can be found on our Past Events page. Our group's calendars have always been popular and we have just published our new 2019 calendar. 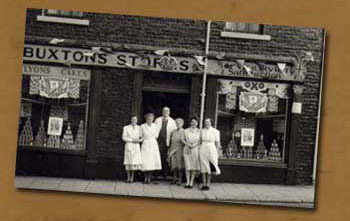 It depicts pictures of Normanby scenes of a bygone age. 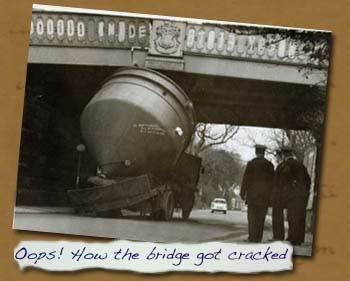 So you can remember & reminisce about our village as it once was in the past. Please note that this calendar is in the new design adopted last year and is the same price as last year. See our Publications page for more details & availability. The author Sylvia Fairbrass has been a keen and active member of our history group for many years and this is her second book to be published by our group. This comprehensive work includes personal accounts from former employees and is illustrated with maps and many photographs. 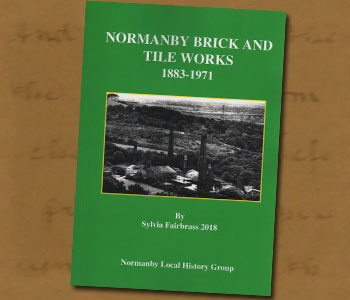 Newspaper articles and personal letters also help to tell the story of an industry that was an integral part of Normanby life for many years. Sylvia has, through painstaking research, also compiled a list of former employees and a description of their occupations. This is the tenth booklet to be published by our group & is in colour with 92 pages. 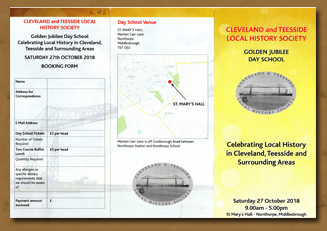 This Day School is an opportunity to reflect on the development of local history studies over the past 50 years, to celebrate some achievements of societies and groups in the Cleveland & Teesside area in that time and look to the future. Popular local speakers from local societies have been brought together to provide insights into their experience. Our group member Sylvia Fairbrass will be speaking about our group’s involvement in the making of the film about local hero William Henry Short V.C. at this day school. 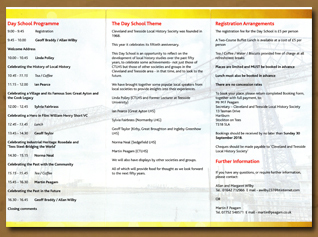 Please click on the leaflet images opposite to see the detail ! This is a special event organised by the Eston & District Branch of the Green Howard’s and Yorkshire Regiment Association. You are welcomed to a short service, with the aim to remember the men from our area who gave their lives in the Great War which ended one hundred years ago. 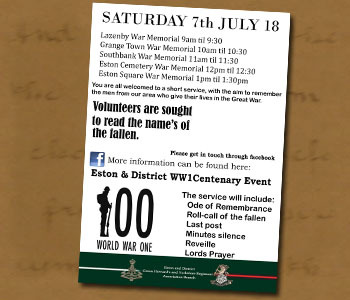 Services will take place at various war memorials (see poster) but that for Normanby will be held in Eston Cemetery (as it could not be held at the War Memorial on the High Street). The service will include: Ode of Remembrance, Roll-call of the fallen, Last Post, Minutes silence, Reveille, Lord’s Prayer. Please click on the poster image opposite to see the detail ! 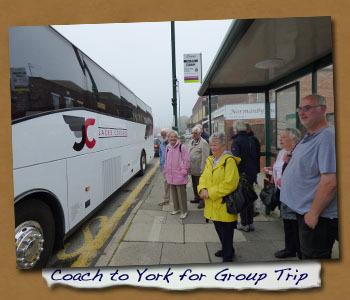 Members of our group spent a day visiting York including the Castle Museum. It was a very enjoyable experience that was both interesting and informative. New Article - Work-in-Progress !! 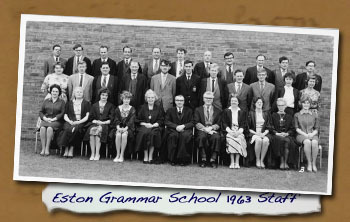 This Article features a list of the class photographs from the 1963 Year Book of Eston Grammar School. This Year Book was given to our Group for safe-keeping by a former member of the school staff. As many names as possible of the pupils and teachers are identified for each photo. Please feel free to view and enjoy them - perhaps recognise yourself and former classmates - and so provide us with more names to add. This new Article is regularly updated with your input ! So do come back again and look for new entries ! "Eston Grammar School Year Book 1963"
All those prior to 2018 have been moved to a separate page so as to keep this home page more timely. See Previous News & Articles from 2011 to 2017.